The award-winning Pittsburgh Marriott City Center effortlessly blends style & substance here in the heart of the city. You'll find our hotel near Heinz Field across from PPG Paints Arena & minutes from downtown. Spacious, intuitively designed rooms & suites feature pillowtop bedding, flexible workspaces, marble bathrooms & high-speed internet access; many also showcase views of the Pittsburgh skyline. Additional amenities of our hotel in Pittsburgh, PA include a heated indoor pool & state-of-the-art fitness center. Steelhead Brasserie & Wine Bar, our reimagined restaurant, offers a trendy ambiance & exceptional cuisine, while Crafted North stands as Pittsburgh's most exciting cocktail destination. Planning an event in the city? Our hotel features expansive, well-designed Pittsburgh meeting spaces, including a stylish ballroom and outdoor courtyard space. Stay minutes from the best of downtown Pittsburgh - from Duquesne University to Heinz Field. 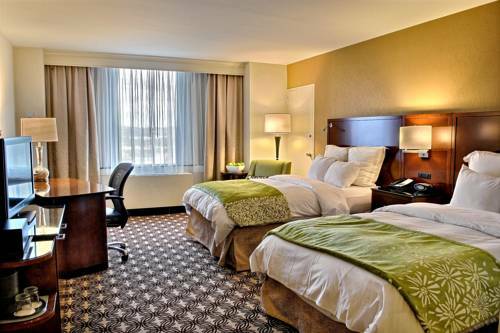 Let us welcome you here to the Pittsburgh Marriott City Center. Crafted North: Crafted North, the stylish onsite bar & lounge at our hotel in Pittsburgh, PA, features artisanal cocktails and an exceptional wine list. It's a wonderful place in which to cap off a busy day here in downtown Pittsburgh, PA.
Steelhead Brasserie and Wine Bar: Casual & trendy, the newly updated Steelhead Brasserie & Wine Bar is much more than just a seafood restaurant; we're establishing ourselves as one of Pittsburgh's most unique venues for drinks & dining. Join us for an extraordinary experience! Starbucks : There's no better way to fuel up for a successful morning in downtown Pittsburgh than with a delicious cup of Starbucks coffee & a breakfast pastry. Visit our coffee bar here in the lobby.